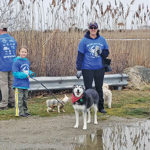 A group of volunteers took to the beaches and roads of West Island in Fairhaven on Saturday, 4/6/19, to clean up the winter’s mess. “Just wanted to give a huge THANK YOU to the awesome volunteers both from the island and the local businesses in town,” wrote organizer Jill Souza on Facebook. “The generous support from our sponsors covered all expenses, please continue to support them as they do us! The best part to me is seeing all ages come together whether helping set up, handing out shirts, towing boats and much more. The island is a better place because of everyone involved.” Items included a small fiberglass boat, tires, windows, pallets, and even a broken toilet. Some items were on the beach, some had clearly been dumped in the wooded areas off the roads. 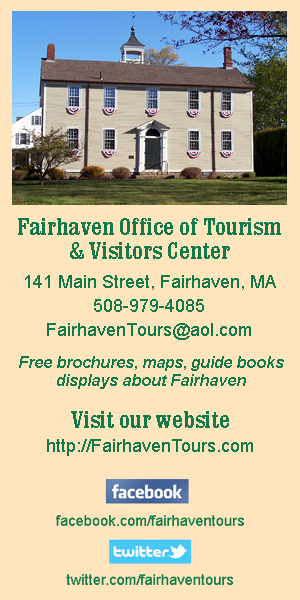 The Fairhaven Public Works Department took away the pile on Monday, 4/8. 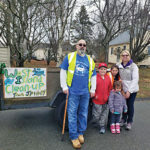 JP & Holly Lemieux team up with the young’uns for the annual cleanup on West Island in Fairhaven on 4/9/19. Photo courtesy of Jill Souza via Facebook. 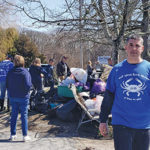 Volunteers get the pile in order to be picked up later at the annual cleanup on West Island in Fairhaven on 4/9/19, while Scot Pomfret flashes his best…er….smile? Photo courtesy of Jill Souza via Facebook. 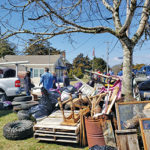 The pile of junk is impressive at the annual cleanup on West Island in Fairhaven on 4/9/19. Photo courtesy of Jill Souza via Facebook. Volunteers got together on 4/9/19 for the annual cleanup on West Island in Fairhaven. Photo courtesy of Jill Souza via Facebook. 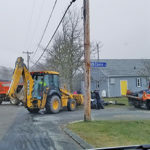 The Fairhaven Public Works Department picks up debris and trash on Monday, 4/8, that was collected during the West Island annual cleanup on Saturday, 4/6/19. Photo courtesy of Scot Pomfret.